The fresh produce season of summer here in the South brings all kinds of amazing opportunity to create amazingly fresh twists on classic favorites. Salsa isn’t getting ignored in this flavor train. 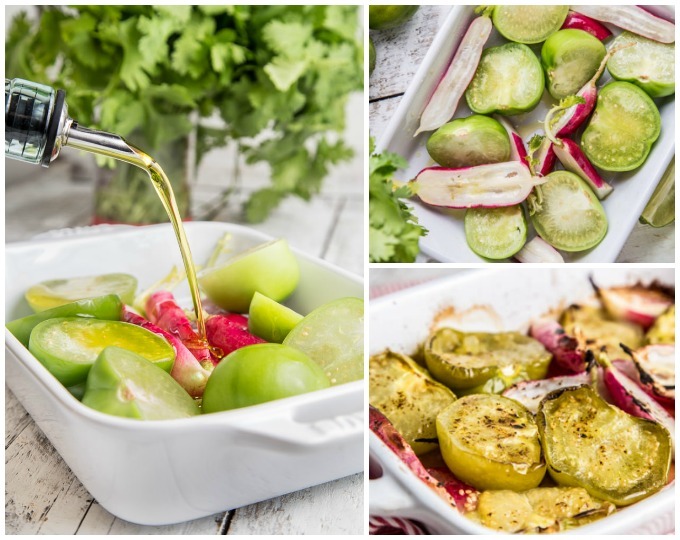 With a box full ‘o goodies, I decided to roast some tomatillos along with a few radishes for a seasonal sizzle that will top your chips and the charts. If you’re going to throw the ultimate backyard bash, and I know you want to all throw the ultimate back yard bash, you better have your salsa game strong. None of that jar of whatever on the table. That’s right. I’m judging you by your choice of salsas (as one should). It takes minutes… MINUTES… to whip up a great homemade salsa. 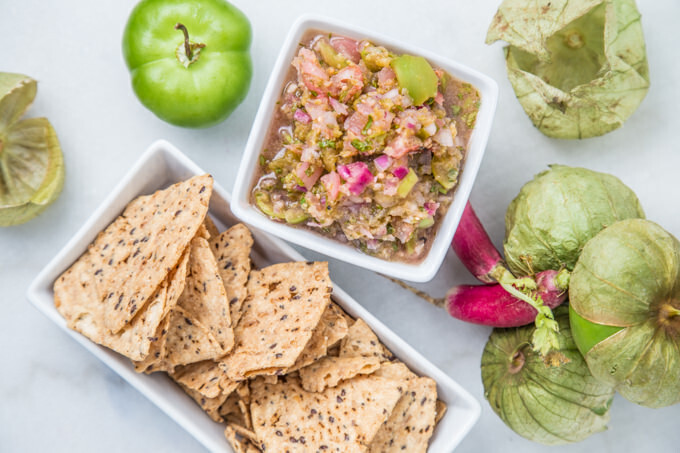 All you really need are tip-top ingredients and some creativity to make you own unique chop on undoubtedly one of the best side snacks. As y’all have probably seen before, I subscribe to a grocery delivery service called Green Bean Delivery. 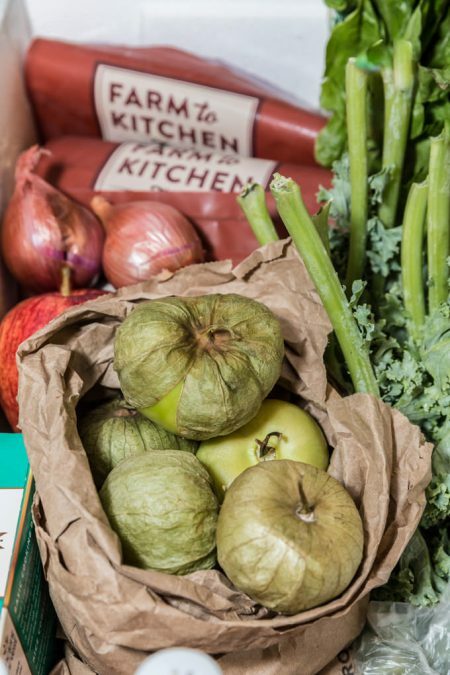 It’s the best way that I’ve found to have absolutely fresh local ingredients delivered straight to my doorstep. Read to the end for a discount on 3 orders. Literally, y’all. I could stay in bed until noon with my blackout curtains pulled and eventually crawl out of bed knowing that I have everything for the next week sitting in the little green box on my front porch. 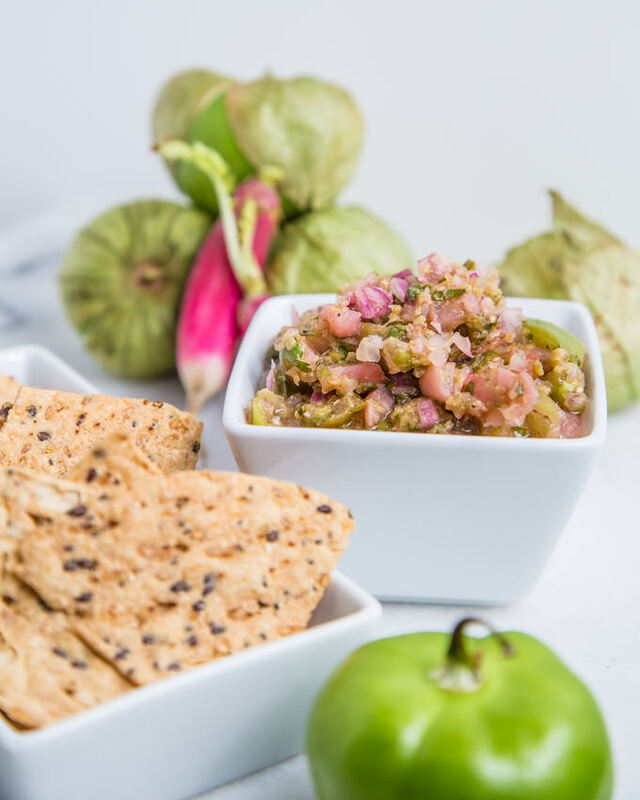 I order everything from sushi quality tuna, local meat, bread from my favorite boulangerie in Nashville, to the most perfect little tomatillos and French breakfast radishes ever. If I were to go out to shop for everything that I get through the service, I would have to go to several different grocery stores and specialty markets around town. Even then, I probably wouldn’t be able to find some of the offerings that they have. I’ve been a customer for nearly two years, and can vouch that they are exceptionally customer oriented. It’s truly a pleasure to be part of and have a chance to encourage others to use a service that I feel so strongly positive about. The star of this salsa showcase showdown has to be the cute, lovely, little French breakfast radishes. These are longer radishes that are late-1800’s heirloom French variety veggies. They’re that cuter sister that gets all of the attention (and rightfully so, tbh). They have a mild spicy flavor that balances the tartness of the tomatillos. It’s a match made in specialized salsa heaven. Pack up your GBD bin and get to party makin’! 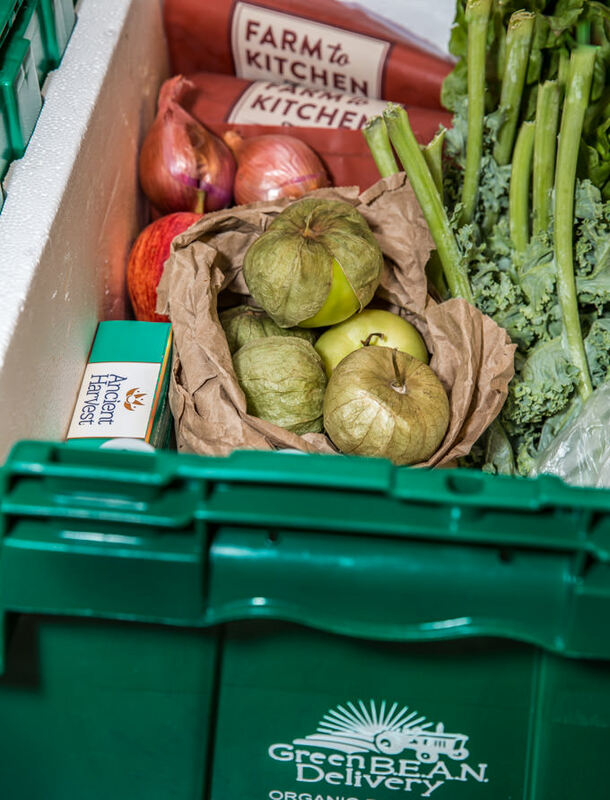 — Check out the Green Bean Delivery site to register to shop for your own culinary cues. 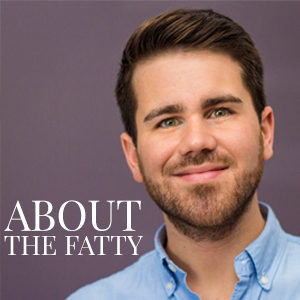 PS — Use promo code SFATTY for 15% off of your first THREE orders. 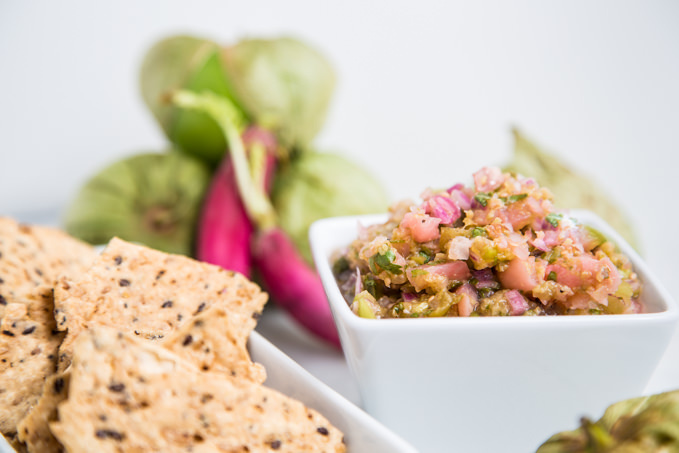 Salsa verde with tomatillos and French breakfast radishes for a tangy, spicy kick. Roasted to bring out the great flavors. From SouthernFATTY.com. Remove the husks of the tomatillos. Rinse to remove the sticky outer layer. Quarter half of the tomatillos and cut all of the radishes in half lengthwise. 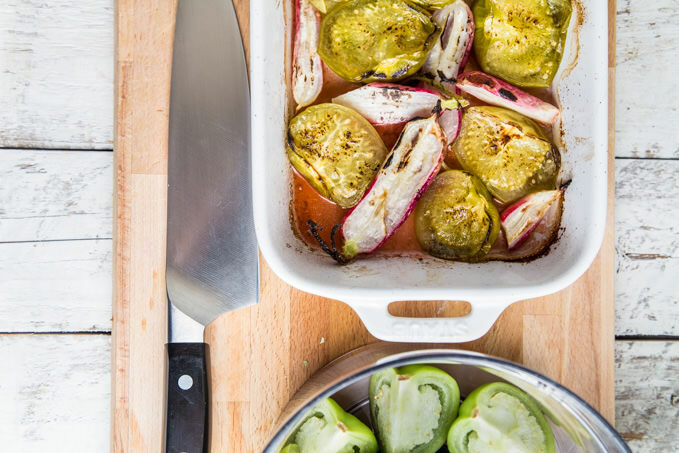 Under a low broiler in the oven, roast until tomatillos are blistered and somewhat blackened. Alternatively, you can choose to not roast the radishes to keep a more colorful finished product. Place the roasted tomatillos and radishes, along with the raw remaining tomatillos into a food processor. Add the remaining ingredients and pulse until desired consistency. Enjoy with chips or tacos. THREE orders from Green Bean Delivery. This post was made possible through a partnership with Green Bean Delivery. I am a paying customer of GBD, and work with them in partnerships from time to time. We are happy to share our experiences and thoughts with brands we know and trust. This salsa sounds so good! I’ve never tried that particular variety but I love radishes! The flavors in this sound perfect! Thanks! It’s great. You could definately swap them with regular radishes, but if you find these give them a try. I’ve never thought to make my own green salsa. I’ll try it out! Wish I lived where this service operated. Sounds great!